Like many government seals and flags across America, Lehigh County, Pennsylvania’s seal includes a collection of images that reflect its history and culture. These images include—among other things—cement silos, textiles, and a farm, symbolizing significant aspects of the County’s early economy; the Liberty Bell and a red heart, symbolizing its role in the American Revolution and its sense of patriotism; a lamp with books, representing its schools; and a cross, recalling the early Christians who settled Lehigh County in pursuit of religious freedom. But in 2016 a militant atheist group sued the County, saying that the cross establishes a government church and must be removed. Oral argument took place on September 7, 2018. The court has placed the case on hold while the Supreme Court considers a challenge to a historic war memorial on public land that includes a cross. Freedom From Religion Foundation v. Lehigh County. The Becket Fund for Religious Liberty (n.d.). Retrieved from https://www.becketlaw.org/case/freedom-religion-foundation-v-lehigh-county/. Freedom From Religion Foundation v. Lehigh County. (Apr. 04, 2019). https://www.becketlaw.org/case/freedom-religion-foundation-v-lehigh-county/. "Freedom From Religion Foundation v. Lehigh County." The Becket Fund for Religious Liberty. Accessed [Apr. 04, 2019]. https://www.becketlaw.org/case/freedom-religion-foundation-v-lehigh-county/. 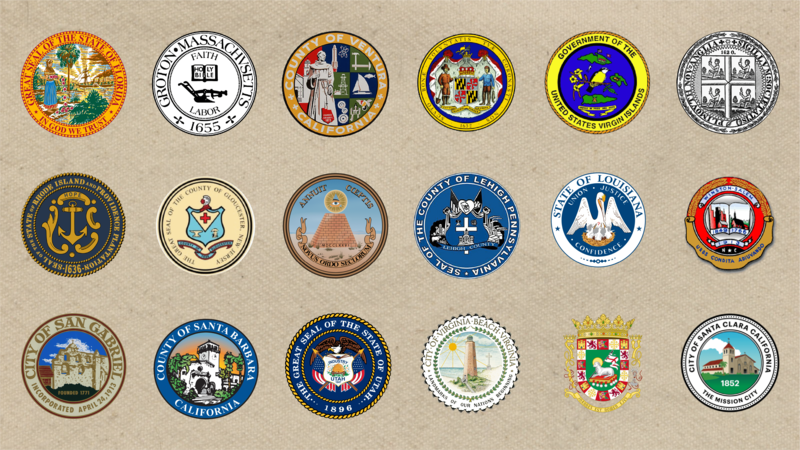 Images of historic significance are common on the seals and flags of states, counties, and towns across America. New Mexico’s flag has a single image: the sacred sun symbol of the Zia Native American tribe. Louisiana’s flag has a symbol of a pelican with a bleeding heart that feeds its hatchlings, a symbol long used to illustrate how Christians are nourished by the Eucharist and reflecting the early French Catholic influence in the Louisiana Territory. Utah’s flag and seal have images recalling the Mormon pioneers. And many seals and flags in the American southwest have images of friars and mission churches reflecting the early influence of Spanish Catholics in that region. Lehigh County, Pennsylvania’s seal includes a collection of images that reflect its history and culture. These images include cement silos, textiles, and a farm, symbolizing significant aspects of the County’s early economy; the Liberty Bell and a red heart, symbolizing its role in the American Revolution and its sense of patriotism; a lamp with books, representing its schools; and a cross, recalling the early Christians who settled Lehigh County in pursuit of religious freedom. The county’s seal has existed for over 70 years without controversy. But in 2016, militant atheists from the Wisconsin-based Freedom From Religion Foundation (FFRF) sued, demanding that the federal court in Pennsylvania scrub the cross from the county’s seal. They claim that including the cross among the dozen symbols on the seal establishes the Christian religion as the official county religion, and so it must be removed. So, Lehigh County is fighting back—not to endorse one religion over another or religion over nonreligion—but simply to preserve a small reminder that the religious minorities who settled Lehigh County played an important role in its history that is worth remembering, just as it is worth remembering Lehigh County’s early role in the American Revolution, its early economic influences, and its patriotism and schools. Memorializing history is not unlawful just because aspects of it happen to be religious. In September 2017, a federal judge issued an opinion noting that Lehigh County’s seal complies with the actual text of the First Amendment and with the intent of the founding fathers, who wanted to protect citizens from having to worship against their will or pay for churches they didn’t like, but never intended to strip every reference to religion from the public square. The court thought the case should be “cut and dry” for the county. But instead of applying the actual text and meaning of the First Amendment, the court felt bound by an old Supreme Court case, Lemon v. Kurtzman, which requires courts to guess whether the government is trying to “endorse” religion whenever it mentions God or religion. Thanks to Lemon, the courts are flooded with cases challenging “In God We Trust” on our coins, the phrase “Under God” in the pledge of allegiance, prayers in public meetings, and the countless religious images on state and federal buildings, flags, seals, and war memorials. Even the Supreme Court seems to agree that enough is enough. In recent years it has moved away from the Lemon test, ruling that manifestations of religion in government and in the public square that were acceptable at our nation’s founding are still acceptable today and that recognizing the role of religion among our nation’s peoples, history, and culture does not violate the Constitution. The case is now on appeal in the Third Circuit Court of Appeals, which will decide whether Lehigh County included the cross to force Christianity on its citizens or whether the cross is simply a reminder, among a dozen others, of one significant aspect of the county’s history. Oral argument took place on September 7, 2018. The case is now on hold while the Supreme Court considers a challenge to a historic war memorial on public land that includes a cross. Becket has also defended a World War II religious memorial in a Montana ski resort, a historic Pensacola park cross monument, and a 9/11 Ground Zero cross artifact, among others. Public Square: Religion is a natural part of human culture and has a natural place in the public square. The government is not required to strip the public square of important symbols just because they are religious.